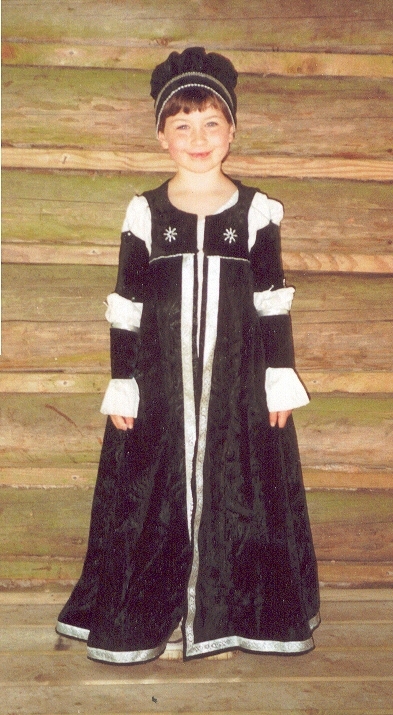 This gown was made for Cassandra when she was 4+1/2 years old. She liked the gown so much, she called it her "Queen Gown". It is made from patterned green velvet seen below. The underdress is made from Slubby Silk Noil, the Gown took a total of 45" x 2+1/2 yards of velvet, and 45" x 1 and a bit meters of silk. The hat is just a circle of fabric pleated to the flat band of velvet, more pleating in the front, and less in the back. The silver trim around the dress of the gown was picked up inexpensively at the Little India in my area, and the Hat trim was bought from a friend as a scrap from her dress. The beadwork done on the bodice, waistband, and hat was by a good friend of mine in exchange for making her a gown for her late period italian persona. She did a fabulous beading job, it makes the whole gown come together. *sigh* I really should learn how to bead! 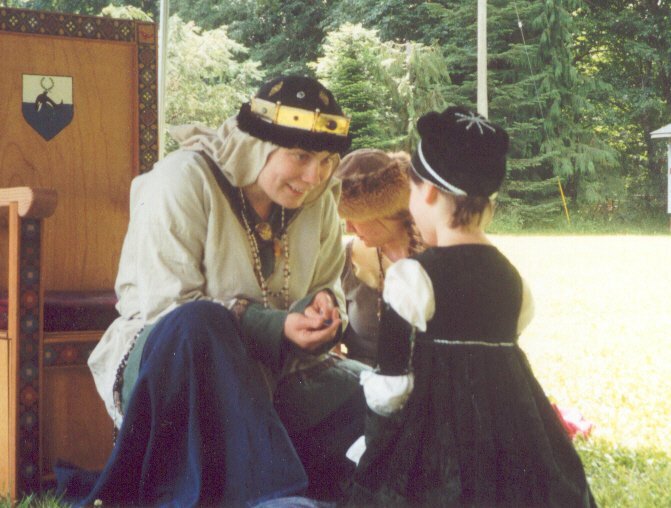 Pictures of Cassandra in the dress, taken by Alicia the Willfule with many thanks. All other pictures taken by me!